Up to 30-percent of a home’s heat loss occurs through its windows and each time you increase the setting of your thermostat by one degree, your energy use increases by two percent. Your dream home should have energy-efficient windows and you’ll need to understand a few simple terms before you discuss your preferences with your home builder. Calgary winters are snowy and cold and the best way to keep your new home cozy and warm is to prevent the transfer of heat through your windows. Conduction – the transfer of heat through solid materials. Low-conductance materials impede the transfer of heat. Convection – the transfer of heat through a fluid, liquid, or a gas, such as air. In cold climates, warm indoor air passes across interior window surfaces. As the air cools, it falls toward the floor. When warm air rushes to take its place, a cycle, called a convective loop is formed. A convective loop is self-perpetuating; you notice it as a draft, and turn up your heat. Radiation – the transfer of heat from warm to cooler materials. Radiant heat is felt as it emanates from a fireplace. A window’s U-factor allows a comparison of the insulating properties of windows. The insulating value of glass keeps heat in during the winter and out during the summer. A lower U-factor indicates a reduction of non-solar heat flow through a window. Lower U-factors indicate greater insulation. A higher R-value indicates a greater reduction of heat flow. While U-factors are typically used to express the insulating value of windows, R-values are generally used to describe the insulating factor of other parts of a building’s envelope such as a wall, roof, or door. Most of us relate better to R-values. To convert a window’s U-factor to an R-value, divide one by the U-factor. For example, a 0.5 U-factor equals a 1/0.5 = 2 R-value. Radiant heat loss is greatest in regular, clear windows because the glass absorbs heat. The inside surface of Low-E coated glass reflects radiant heat into the room, keeping your home warmer in the winter. The outside surface of Low-E coated glass reflects heat away from your home during the summer, keeping it cooler inside. Low-E glass is coated with metallic oxides that reflect up to 90-percent of the long-wave heat energy of light, while allowing shorter wavelengths, or visible light, into your home to light it naturally. Multiple-glazed windows trap a low-conductance gas such as argon, between panes of glass. Multiple panes separated by a gas that’s low in conductance, when combined with a thermal resistant frame, raises the temperature on the inside pane, slows the convective loop, keeps your home warmer, and lowers your energy use. A high performance double-pane window has a U-factor of 0.30, while some triple-pane windows can achieve U-factors as low as 0.15. 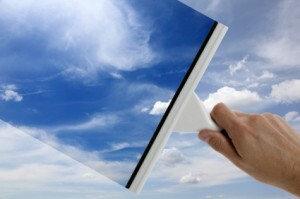 Heat loss occurs when warm air leaks to the outside from around your windows. Window manufacturers typically give a value for air-leakage in cubic feet-per-minute for each square foot of window. Look for a certified air-leakage rate of less than 0.30 cfm/sq ft.
A well-designed window will also have high-quality weatherstripping, hardware that stops air-leakage, and a frame made of a material with a low U-factor. The table below lists framing materials and their corresponding U-factors. Remember these terms when you speak with your home builder. Calgary homes that are energy efficient have multiple-glazed windows with low U-factors, high R values, Low-E coatings, low air-leakage rates, and are framed with thermal resistant materials.